Letter plates for entrance doors have always been the preferred choice in the UK as opposed to the residential mailboxes of the US, and here at Ironmongery Experts, we have a wide selection of letter plates available in brass, steel, and chrome metal finishes. 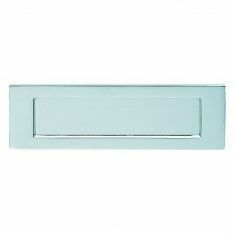 Like letter tidies, these fixtures facilitate the safe acquisition of mail through your front door, and like most entrance door ironmongery, the correct size and shape should be chosen depending on the door in question. Ironmongery Experts also stocks a large range of other accessories, locks & latches as well. For example, our diverse selection of deadlocks operate with either key or thumbturn, and utilise a single bolt without a latch. Our sashlocks incorporate a latch alongside this deadbolt, making them more suitable for modern homes and entrance doors. For garden sheds and conservatory doors, mortice bolts are usually a good fit. Lightweight and durable, they provide the bare necessities for low-maintenance doors around the home. And for a simple approach to front and back doors, choosing from our range of nightlatches has never been more efficient – easy to install and change if need be, these locks sit on the frame instead of being morticed into the edge of the door, so they provide versatile security in a compact form. For doors with the doorknob aligned in the centre, there are many elegant options in our selection of centre door knobs, and for those without a handle or doorknob at all, try our assorted cylinder pulls for greater leverage and a sturdy frame to your lock. If you want something with aesthetic appeal, our catalogue of contemporary and authentic door knockers are sure to impress, available in a wide array of metal finishes and designs. We also stock several options for bell pushes, from functionally plain to more ornate models. Or, you can browse our collection of numerals & letters for some added identity for your front door. To ensure your security is up to scratch, consider our selection of door chains available in polished brass and satin chrome, or our stylish yet subtle door viewers to complete your front door setup.